The featured artist for April is DENISE HAWTHORNE. Denise writes “My studio, six miles north of Lincoln, is a renovated Methodist Chapel that dates back to 1869. It is a quiet peaceful retreat in which to work. I taught Art and Design at a comprehensive school for over twenty years, then at Lincoln College for a further eight years. Although I enjoyed teaching and the company of young students, it has been a real luxury to be able to concentrate on my own work since I retired, and I still teach adults at weekly classes and in workshops at my Studio. I exhibit every year with Lincolnshire Artists Society and the Nadin Group, and I have an Open Studio one week each year. The featured artist for March is Elaine O’Donnell. Louth-based Elaine has recently become a finalist in International Artists Magazine Art Challenge ‘Florals and Gardens’ competition in America with her watercolour painting Iris Florentina. She has recently taken portrait painting workshops at the Florence Academy Studio of Arts in Italy and will be returning there soon to study under Teresa Oaxaca. In the UK, Elaine has taken workshops at the Norfolk Painting School, studying new techniques in oil-glazing and scumbling with course director Martin Kinnear. She has also won many national watercolour awards in the years since 2001. The featured artist for February is Lincolnshire painter, John Michael Webster. A semi-retired illustrator and designer, Michael now paints and draws without the constraints of “the brief”. His interests include industrial history, agriculture, architecture and machinery and the natural world. 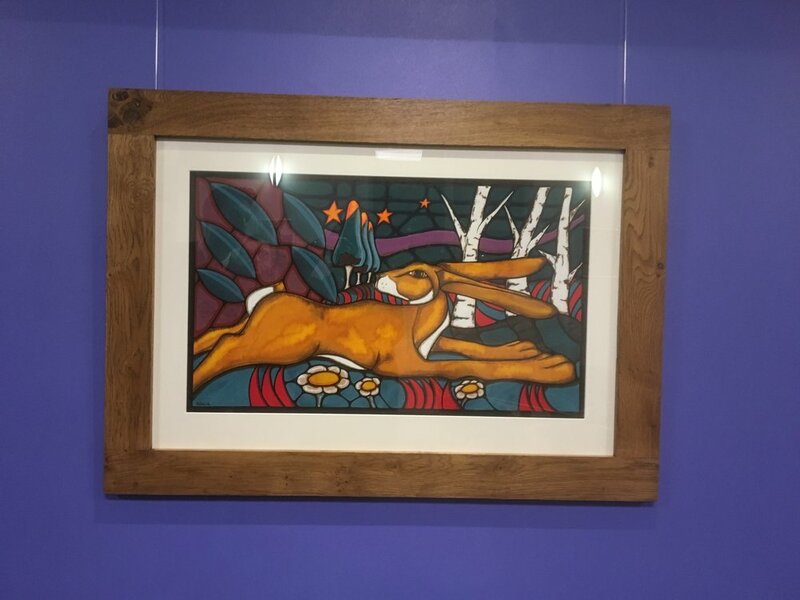 Before moving over to Lincolnshire to run painting holidays with his wife Anna, he worked as a self-employed illustrator and visualiser working for a wide variety of clients. His illustrations have been used by many national and international clients to sell a wide range of products from airlines, chemicals, clothing, local services and building projects to cinema promotions and urban rail systems. Michael now works mainly in watercolours but also enjoys oils, gouache and acrylics. The featured artist for January is Ali Hunter. Ali is a Louth-based illustrator and artist. She usually works in acrylics on canvas but also likes to work with ink and coloured pencils. She is inspired by unique shapes and patterns, and how lighting and shadows can change the viewer’s perspective of a scene. Ali has built up a portfolio of paintings of cats and is interested in natural backdrops for the animals that she paints. She also likes drawing from memories of her childhood as well as creating some strong architectural and landscape images. The featured artist for November is Bridget Jones. Bridget has come to painting later in her life, following a career in business computing. Having started painting in 2002, she has become increasingly immersed in landscape painting using both watercolour and oil. Her work is free-flowing, often with dramatic skies, and her inspiration comes from the places she walks and visits. She has had many exhibitions, and is happy to take commissions. Bridget lives in Louth where she also holds watercolour and oil painting workshops at her home. She has also taught painting classes on cruise ships. Within the classes, students are encouraged to free up and to adopt a loose style of painting. Louth-based Helen is exhibiting a series of her oil paintings. Having studied Golden Age Art at Sheffield Hallam University back in the 1980s, she has rediscovered her interest in painting in recent years. Helen paints mainly for enjoyment and enjoys exploring the role that light can play in the depiction of solid forms. The majority of paintings on display have all been created using a very limited palette of just three or four colours. The featured artist for September is LEO SLATER. Leo has come to painting in retirement, following a long career in the Royal Navy. Having gained a BA Hons degree in Fine Art at London Guildhall University, he now enjoys working as a full-time artist in rural Lincolnshire. His work explores how the brain perceives things based upon memory, nostalgia and imagination. Bob is a landscape artist concentrating on the wilder parts of Britain. Inspiration comes from having lived amongst the hills and moors of the North Pennines and this, together with our wonderful coastline, has shaped his work. His paintings, nearly always developed from sketches, are in acrylic, watercolour, ink and pastel usually in combinations of some or all of them. Bob is represented by galleries in the North of England, Wales and Scotland as well as in his home county of Lincolnshire. 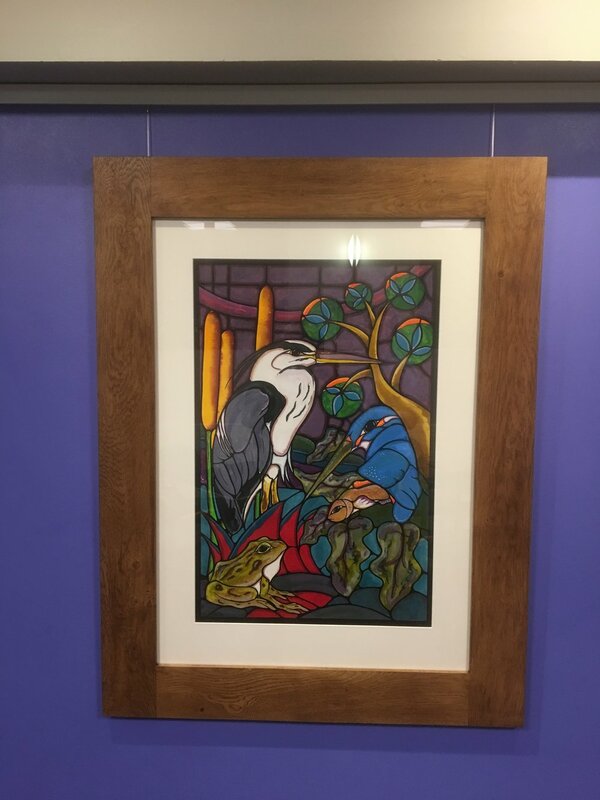 He is a past prize-winner of the Spirit of Lyn art competition and has been featured in articles in Artists and Illustrators and The Artist magazines. In 2012 he was a finalist in the Sunday Times Watercolour exhibition at the Mall Galleries in London, and he has just been selected again for the 2018 exhibition. She has imagined a fictitious army consisting of 100 female soldiers, created specially for the centenary celebration of some women winning the right to vote. Each comrade appears at first glance as a domestic, decorative object; forms and shapes resembling functional items such as vessels, teapots and clothes pegs often balance precariously and in improbable ways. Fecund and fertile forms are imbued with a confidence and regimentality that suggest these girls are definitely organised and 'up to something'. Her playful batallion of Rebel Daughters is up for inspection in the theatre foyer during the month of May, Monday to Saturday 10am to 1pm and on performance evenings. The featured artist for March is Deborah Geddes. Deborah is a Louth-based artist who graduated from Nottingham University in 2015 with a BA Hons in Fine Art. The main body of her work explores the impact of moving something or someone from its original place. Deborah likes working with oil pastels but also uses graphite powder, inks, acrylics and watercolour. She likes experimenting with colour, drawing inspiration from nature and the landscapes that surround us. The featured artist for February is Carol Emsley. Carol is a local artist who has painted for many years. She trained at Hull College of Art from 1989 to 1994. She loves using all media - oils, watercolour, pastel - and she has won many awards including Best Oil in the Society of Floral Painters' exhibitions and the Derwent Award with the Artist Magazine exhibition at Patchings Art Centre in 2017. She was also a finalist in a Flowers and Gardens competition in the International Artist magazine. Carol has been a member of the Ropewalk Print Group for the last six years, making original etchings, drypoints and monoprints, and is really enjoying this new medium. Collage and mixed media is another area of interest. The featured artist for January 2018 is Janice Kok. Her exuberant and colourful canvases will lighten up the Riverhead Foyer and Gallery during our Panto season. “After nearly thirty years of office work, I studied A-level Art at evening classes. I had found my place. I fortunately had the opportunity to go on and study for my Degree and Masters in Fine Art. My painting greats are Barbara Rae, Patrick Heron, Kandinsky and Matisse.